Crown Coat Front was located at 105 E. 16 St. from 1947 to 1957/58. A coat front is defined by George E. Linton (The Modern Textile and Apparel Dictionary, Fourth Revised and Enlarged Edition, 1973) as "Trade term for a built-up stiffening or shape-retaining interlining for the fronts of coats, made of stitched layers of haircloth, felt and canvas." For the Nov. 2002 condition of this sign click here. A few details have been lost and the color was considerably faded. Frank Jump has a nice photograph of Crown Coat Front and the Carl Fischer Musical Instruments sign next to it on his website at http://www.frankjump.com. Crown Coat Front was involved in a law suit with the US government regarding canteen covers provided in 1956. The suit was argued before the Supreme Court in 1967. 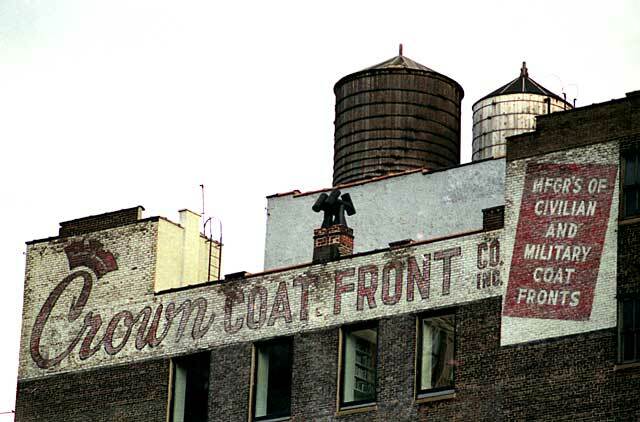 An image dated 1933 on the New York Public Library's Digital Collections shows that prior to Crown Coat Front a sign painted in the same position read Hyman & Oppenheim / Human Hair Goods. Hyman & Oppenheim were longtime occupants of 105 E. 16th St. (from 1910 to 1931). The original Hyman was Gerson Hyman (1852-1911), a native of Wirballen, Russian Poland (now Lithuania). His two sons, Louis Hyman (1882-?) and Joseph Hyman (1886-1932), succeeded him in the business. The original Oppenheim was Manuel Oppenheim (1851-1917). He was born in Neustadt, Suwalki province, also in Russian Poland (now Lithuania). He was in the hair business with his brother, Heyne (or Heine) Oppenheim, in the 1870s before going into partnership with Gerson Hyman around 1885. Manuel Oppenheim's son, Jesse Oppenheim (1876-1936), succeeded him in the business. When Jesse Oppenheim applied for a passport in 1920, a letter signed by Joseph Hyman was attached stating that Oppenheim had at that time been with the corporation 27 years. This was written on Hyman & Oppenheim stationery (click for image). Around 1939 Hyman & Oppenheim changed its name to Hyman & Hyman, and they were located at 38 W. 48th St. One of these Hymans was Louis Hyman, but I'm not sure who the second Hyman was (Joseph was already dead). The business had also changed and seems to have dealt mostly in distribution of beauty products rather than strictly hair goods. Hyman & Hyman were in business until the early 1970s. Also on this wall, beneath Crown Coat Front, is an obscure sign reading H GOT (click for image). This is a remnant of a sign for H. Gottfried, Neckwear, who were located here from 1915 to 1926. H. Gottfried was Harry Gottfried, an immigrant from Russia, born either 1871 or 1872. His naturalization petition in 1893 said that he was born 1 August 1871 and that he emigrated from Russia in 1887. He was recorded in the 1900 U. S. Census age 27, living with his father, Mendell Gottfried, at 233 East 10th St. By this time he had already begun his neckwear business, which began in 1898 at 724 Broadway. In the 1930s H. Gottfried was reconstituted as Harry Gottfried Cravat Corp., incorporated in 1931 and located at 50 W. 29th St. This business lasted only a few years. In 1938 Harry Gottfried and his wife, Vera Gottfried, filed for bankruptcy protection.